I haven't gotten much knitting done because I worked all weekend. One of the things that makes work fun, besides the paycheck that is, is the interesting money we come across. It never fails to amazes me the interesting & comical things that get drawn on Washington's & Lincoln's faces. Every time I see a 'happy birthday' message written on a one dollar bill, I wonder if that's all the birthday child received. Some of the messages we find scribbled across the money are disgusting and vile. Sometimes we find a simple doodle drawn on a bill. Last summer there was one particular drawing of a bright blue space alien that kept coming back to us over & over. We'd send the bill out in the morning as part of a cash register's change fund. A customer would receive it & spend it somewhere else in the park and then it would come back to us that night. I must have encountered that one particular little blue alien at least 20 times. And then there's the old money that we come across. 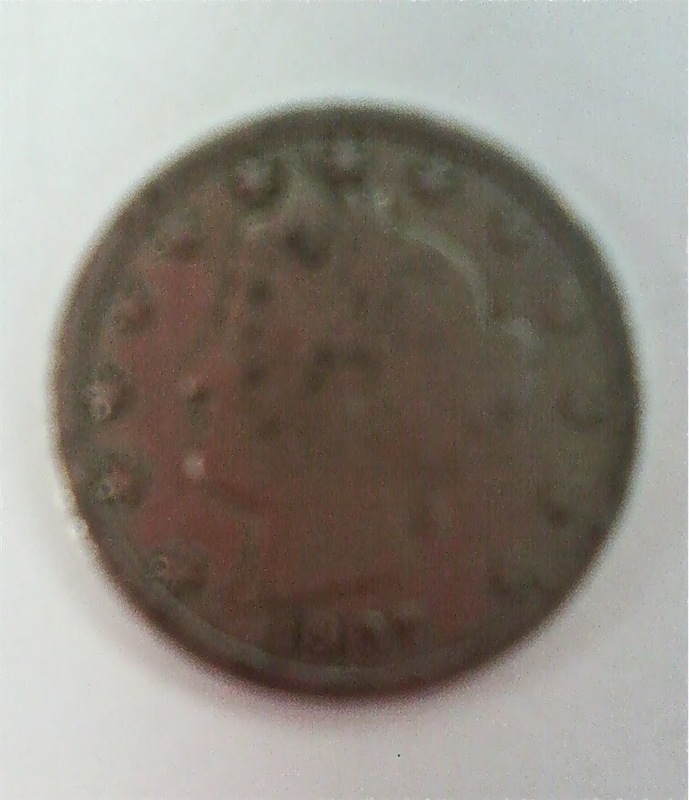 Old money such as this 1907 nickel. Granted, it's a horrible picture taken in bad lighting with my not-so-great, non-smart phone. The nickel is so old, at first glance, it didn't even look like American money. Pretty cool, right? Okay, so the Cash Control department is easily amused. We take our thrills where we can get them. Hawthorne is progressing. Slowly, but progress is being made. And this slouchy hat is almost finished. This hat is serving as my current 'knit while I read my email' project and for some unknown reason, I've been receiving an overabundance of email lately. And that means, the hat has seen a lot of attention considering it's an 'only gets worked on while I'm reading' project. Neither the hat nor the scarf will see much knitting action today though. I'm off to visit my four legged furry friend, Lola and her human.